Milos Raonic's impressive comeback from injury continued on Friday at the Mercedes Cup. The Canadian upset third-seed Tomas Berdych of the Czech Republic 7-6 (2), 7-6 (1) in the quarter-finals of the ATP Tour grass-court event. Milos Raonic's impressive comeback from injury continued on Friday at the Mercedes Cup. "He slipped up a few points early I played a few points well. It's a tiebreaker. It's a coin toss in many ways," Raonic said. "Maybe I had a bit of an advantage because I get free points with my serve, but he was also serving extremely well." 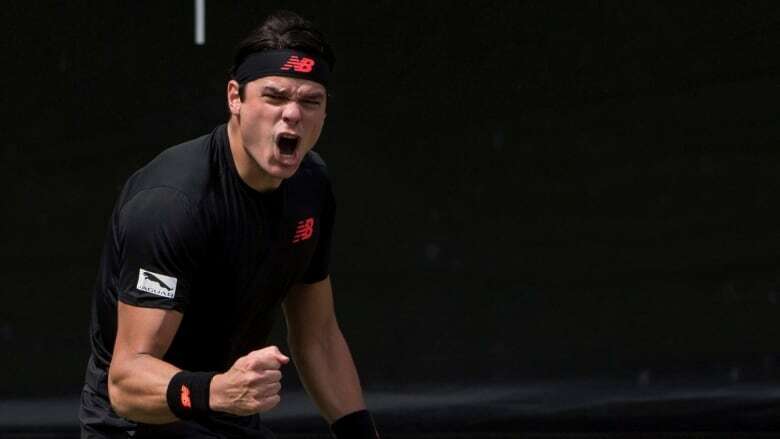 Raonic, the seventh seed from Thornhill, Ont., is playing his first tournament since early May when he suffered an undisclosed injury that caused him to miss the French Open. Raonic's biggest weapon — his booming serve — was effective on Friday. He had 24 aces, as compared to Berdych's nine. Raonic saved the only two break points of the match and then was victorious in both tiebreakers. "To play the two tiebreakers very disciplined and very well was the key today," Raonic said. "The margins were very small, and there were very few chances and I'm glad in the tiebreakers I stepped up." Raonic will face second-seed Lucas Pouille of France in the semifinals on Saturday. Raonic is 2-0 lifetime against Pouille, winning both matches on hard courts in Australia in 2016. Roger Federer also won his quarter-final match, and will play Nick Kyrgios in the other semifinal.